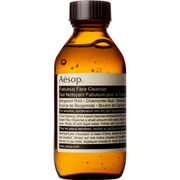 Aesop's first gel cleanser in the Parsley Seed range offers gentle yet thorough cleansing, with the benefit of mild exfoliation from Lactic Acid and balancing from Jojoba Oil. The invigorating, rich lather of this innovative formula suits all skin types and leaves skin feeling completely cleansed, softened and clarified. Liquorice Root - Extracted from Liquorice Root. Contains Glycyrrhizic Acid, which acts as an anti-inflammatory and antioxidant. Helps to even-skin tone..
Lactic Acid - Noted for its ability to exfoliate the skin without provoking irritation. This ingredient works by dissolving dry and damaged surface skin cells, improving the texture of the skin and making it softer and smoother. Build-up of skin cells in the pores is also minimised. Blackcurrant Seed Oil - A rapidly absorbed oil and rich source of Linoleic acid, gamma-Linoleic acid and Stearidonic acid. Anti-inflammatory, anti-oxidant and deeply hydrating. Soothes and softens tired or irritated skin. the series of parsley seed is the superstar of the AESOP.it is really good for my sensitive skin. This Parsley Seed Facial Cleanser leaves your face feeling nice and clean. 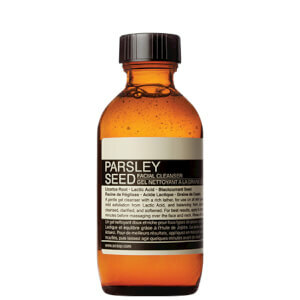 Parsley Seed Facial Cleanser 100ml is a perfect little cleanser for combination/sensitive skin. I was initially worried about the size per pound ratio, but you only need a tiny amount to get skin clean without stripping it and making it feel tight. Definitely recommend and worth the money. I 'd like to use Parsley Seed Facial Cleanser continuelly, nice natually aroma with foam.